When in doubt, have khichdi! Yes, for all the people who think rice and rotis aren’t their style, they can enjoy the subtle yet amazing khichdi. While we all do have our own kinds of khichdis, Truweight brought an all new version of healthy khichdi. 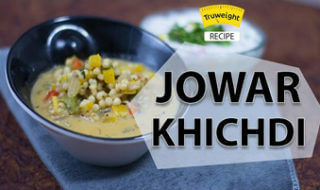 This jowar khichdi is definitely a great way to satiate your hunger. Jowar is a gluten-free, high-protein, cholesterol-free grain that is also rich in many essential nutrients such as dietary fibre, iron, phosphorus, and thiamine. We have sprinkled a generous dose of antioxidants in the form of colourful bell peppers! So indulge in this warm comfort on a cold day or when you don’t feel quite up to the spicy foods yet! Soak jowar overnight in water. Next day, drain all the water. Add 1 cup of water and salt to the jowar in a pressure cooker, mix well and pressure cook for 5 whistles. Heat oil in a non-stick pan and add cumin seeds to it. Add milk to it and mix well and cook on a medium flame for 2 to 3 minutes, while stirring occasionally. Add coriander, mix well and cook on a medium flame for 2 minutes, while stirring occasionally.